An important chapter in aviation history and Singapore Airlines’ strategy for the North America market comes to an end over the next two months as SIA operates its last non-stop flights to the US. Without the A340-500 all-premium flights from Singapore to Los Angeles and Newark, there will not be any scheduled flights over 16 hours and 20 minutes. Ultra long-range routes have proven to be uneconomical, making it unlikely there will be a return of flights over 17 hours, which can only be flown by the niche A340-500 or 777-200LR. There will only be 17 A340-500s remaining in service after SIA phases out the type and these aircraft are being predominantly used on short and medium missions. There are over 50 777-200LRs in service but this is also a very modest number and none of the aircraft are being flown to their maximum range. The world’s longest non-stop route has been Singapore-Newark since SIA launched the exclusive service in May-2004. The route covers 15,345km and is currently scheduled at 18hr55min from Singapore and 18hr40min for the return leg. SIA will terminate service on the route on 23-Nov-2013 as its phases out its niche fleet of five A350-500s. There is a bigger discrepancy between the outbound and inbound flights for Los Angeles than Newark as the Los Angeles flight operates across the Pacific in both directions, including against the headwinds on the return. On the Newark service tailwinds are possible in both directions by going over North Asia from Singapore and over northern Europe or the North Pole on the return. Following the withdrawal of the two services from SIA, three routes will share the distinction of being the longest in terms of scheduled duration – Dubai-Houston, Dubai-Los Angeles and Johannesburg-Atlanta. All three flights currently have block times of 16hr20min, according to Innovata data. Of the three routes that are 16hr20min, Johannesburg-Atlanta is slightly longer by distance, just ahead of Dubai-Los Angeles and Dubai-Houston. After Dubai-Houston comes another Emirates route, Dubai-Dallas. On the return leg from Dallas the flight stops in Brisbane before continuing to Sydney. Qantas does not have A340-500s or 777-200LRs in its fleet and operates the Sydney-Dallas route with 747-400s. Emirates uses the 777-300ER rather than the 777-200LRs on Los Angeles and Houston. Emirates currently uses the 777-200LR to Dallas, which it launched in 2012, but will likely switch to the 777-300ER once the route matures, as it did with Los Angeles and Houston. The larger 777-300ER is a more economical airplane on a per seat cost basis. The 777-300ER and 777-200LR were developed at the same time, with the 777-200LR receiving extra fuel tanks and the 777-300ER benefitting from a larger passenger cabin. The 777-200LR and the A340-500 were specifically developed for ultra long-range flights, with the A340-500 entering service in 2003 followed by the 777-200LR in 2006. But with SIA dropping its A340-500 flights, there will no longer be any route from a distance perspective that is not within range of the 777-300ER. There are still routes that would require the A340-500 or 777-200LR due to departures from high altitude airports and there are routes that the A340-500 would be required because of ETOPs requirements. But for the most part the A340-500s and 777-200LRs are now used on routes which can be flown with 777-300ERs or other types. 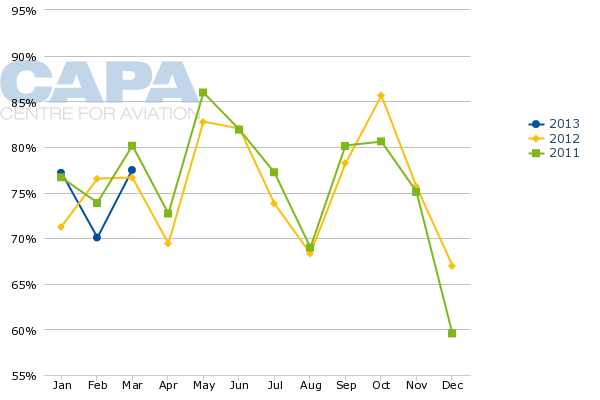 After SIA operates its last non-stop flight from Newark in Nov-2013, there will be only 17 A340-500s remaining in airline service, according to the CAPA Fleet Database. This includes nine aircraft at Emirates, four at Etihad, two at Nigeria’s Arik Air and two at Azerbaijan Airlines. Airbus has agreed to buy back SIA's five A340-500s as part of an order for new types, but given the unpopularity of the type it is unlikely Airbus will be able to place the aircraft at another airline. The aircraft could end up with a government or VIP operator or be scrapped despite being less than 10-years old. After SIA terminates Newark, the world’s longest A340-500 route will become Etihad’s Abu Dhabi-Sao Paulo service, which is about 15 hours. Etihad launched Sao Paulo in Jun-2013 and the route will likely be upgraded to 777-300ERs once it matures. Abu Dhabi-Sao Paulo can be flown with a 777-300ER and Emirates already uses the 777-300ER on Dubai-Sao Paulo. Emirates’ longest A340-500 route is currently Dubai-Lyon, according to Innovata data. Dubai-Lyon is only about seven hours. The carrier uses the A340-500 on a few other European routes as well as on select routes to South Asia, Africa and regionally within the Middle East. With the exception of Sao Paulo, Etihad also uses the A340-500 on a limited number of routes to Europe, South Asia, Africa and regionally within the Middle East. Arik uses the A340-500 from Lagos to New York and Johannesburg, routes of about 10 hours and six hours respectively. Azerbaijan Airlines currently only uses the type on short-haul routes to Dubai and Moscow. The 777-200LR is more popular due to its twin-engine design, which makes it significantly more efficient than the A340-500. But the 777-200LR is still a niche aircraft with no carrier currently operating more than 10 of the type. In total there are just 54 777-200LRs currently in service across nine operators and only two more aircraft are on order, according to the CAPA Fleet Database. If any airline takes a stab at a new ultra long-range route in the 17 to 18 hour range, it would almost certainly be a carrier on this list. Possibilities include Delta testing out New York-Singapore service or Emirates launching Dubai-Auckland. But it is unlikely these or other ultra long-haul routes will occur given the unfavourable economics of ultra long-haul flights. The New York-Singapore market has a high share of premium traffic, which is critical for ultra long-range routes. But as SIA could not make it work in both mixed and all-business configurations Delta will be reluctant to try to fill the void. Unlike the remaining A340-500 operators, the 777-200LR operators continue to use the type primarily on long-range flights. There will continue to be a role for the 777-200LR for long-range routes which are not thick enough for the 777-300ER or 747-400. But some of these routes in the coming years will start to switch over to the 787 or A350. The 777-200LR will at least for now continue to have unmatched range (there is a possibility a new version of the 777 will have even more range). But the reality is airlines are unlikely to use its full potential. Essentially the niche that prompted Airbus and Boeing to developed the A340-500 and 777-200LR has proven to be uneconomical to sustain. At about 17hr30min in both directions and 13,964km, Bangkok-New York was the third longest route after Singapore to Newark and Los Angeles. Bangkok-Los Angeles is 13,309km and is currently served by Thai one-stop with 777-300ERs. Delta also dropped its longest flight by duration, Mumbai-Atlanta, in late 2009. The route was 17hr long, which would now make it the longest flight post-SIA if it was still operating. Air India uses 777-200LRs on Newark-Mumbai but has decided not to use its 777-200LR fleet to launch non-stops from India to the US west coast as originally intended. Newark-Mumbai could be flown with Air India’s 777-300ERs and the carrier already uses 777-300ERs on Delhi-New York JFK and Delhi-Chicago. Air India primarily uses its eight 777-200LRs on short and medium-haul routes, including domestic services and to destinations in North Asia. Over the last few years Air India has looked at sub-leasing or selling its 777-200LR fleet as it is under-utilising the aircraft. Now defunct Kingfisher Airlines also never used its A340-500s to operate non-stop flights to California, which was envisioned when the type was initially acquired. Bangalore-San Francisco, one of the proposed US routes for Kingfisher which never materialised, is 8700mi, or very slightly shorter than Singapore-Los Angeles. Mumbai-Los Angeles is also 8700m. The US-Singapore market enjoys much higher average yields than the US-India or US-Thailand markets. But even with SIA opting for an all-business configuration and charging a premium over its one-stop services in the same market, the yields were not high enough to offset the huge operating costs. SIA in 2008 re-configured its A340-500s from 117 premium economy and 64 business class seats to the current all-business configuration with 100 seats. From a load factor perspective the flights were successful both before and after the re-configuration, except for during the global financial crisis. During the height of the GCF in late 2008 and early 2009 the load factor on the non-stop routes slipped below 50% during some months. SIA tried to mitigate the impact by cutting both routes from daily services to five weekly flights starting Feb-2009. Newark was restored to daily in Jan-2010. Los Angeles was restored to daily in Oct-2010 but went back to five weekly in May-2011 and has since stayed at that level. Los Angeles-Singapore has performed relatively well at the reduced level of five weekly flights, with an average load factor from Los Angeles of about 77% in 2012. The average load factor in 1Q2013, the most recent period available due to the lag in statistics from the US Transport Department’s Bureau of Transportation Statistics, was again 77%. Newark-Singapore has also performed relatively well since the GCF. 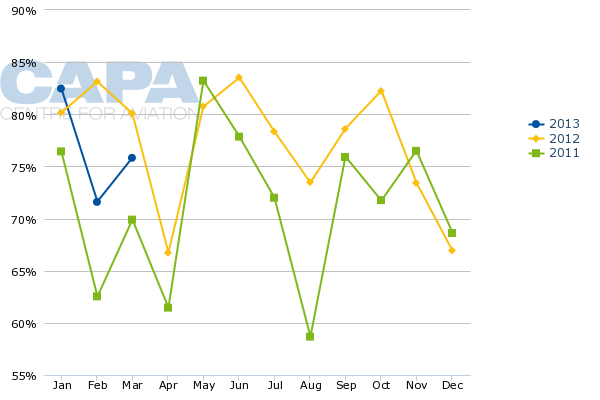 The average load factor from Newark was about 76% in 2012 and about 75% in 1Q2013. But the cost of operating ultra long-range flights simply was too high overcome. At the current high price of fuel, making a profit off such long flights became nearly an impossible mission even when filling the plane with premium passengers. Having exclusive non-stops to New York and Los Angeles had some large intangible benefits including helping win and maintain key corporate accounts. There was also the glamour and prestige associated with operating the world’s longest non-stop routes. But ultimately the incredible cost of operating an ultra long-range service could not be ignored. The world will likely not see another 18hr scheduled flight after SQ21 lands back in Singapore the morning of 25-Nov-2013, completing the last non-stop from Newark. While several airlines have the aircraft to operate such flights and other airlines could still acquire 777-200LRs as the type is still in production, the reality is ultra long-range routes are virtually impossible to pull off at current fuel prices.